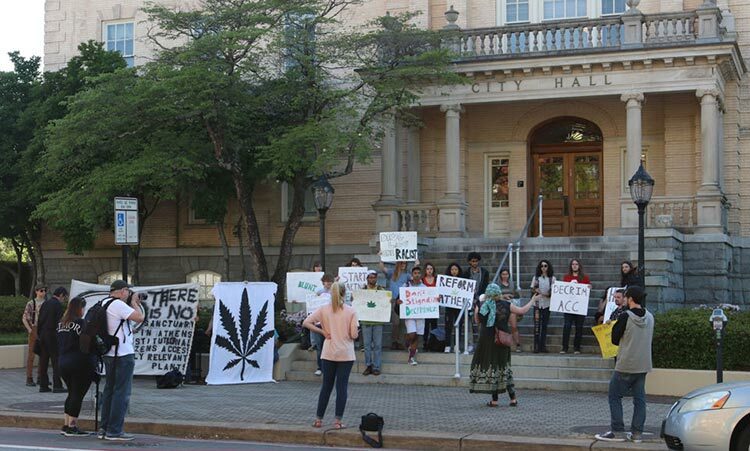 Attendees of the “420 Rally” in downtown Athens used “Weed Day” to call for major changes in how the local and national criminal systems treat marijuana and other drug charges. On April 20 at 5 p.m., members of the Students for Sensible Drug Policy, the Athens C.A.R.E project and the Athens community came together to demand changes to the current cannabis legislation in Athens-Clarke County. Attendees gathered at the Arch in downtown, holding signs that represented their vision for the community. Students and community members advocated for more education and activism on behalf of minority communities most harshly affected by these issues. Nathan Wasserman, president of the Athens C.A.R.E project, hosted the event. C.A.R.E is focussed on educating students and the community about the benefits of access to medical marijuana, as well as the harms caused by the war on drugs, Wasserman said. He believes current policies are failing lower income and predominantly black communities. Historically, the war on drugs has targeted these communities. C.A.R.E has been pushing for a “parallel ordinance” – a law that would be added to the current way in which law enforcement punish possession of cannabis. This law would allow the discretion of police officers to determine how an individual in possession of the drug was charged, either with a fine or with arrest. Currently, Georgia law states that possession of over one ounce or marijuana warrants a felony charge, or up to 10 years in prison. One ounce or less counts as a misdemeanor with fines up to $1,000 and possible jail time of up to one year. The first official speaker at the rally was Democratic candidate for Georgia’s 10th Congressional District Richard Winfield. He was followed by county commissioner candidates Tim Denson, Tommy Valentine and Mariah Parker . All candidates advocated for the decriminalization of marijuana. Valentine and Parker called for support of decriminalization in order for Athens to become a more “progressive” town. Parker loudly chanted, “No justice, no peace,” criticizing the ACC and U.S. criminal justice system for targeting individuals on racial grounds. She argued Athens could become a model for towns and cities across the nation if the thousands of dollars put toward incarcerations were instead used to fund community development initiatives, such as free public transportation. On reaching City Hall, attendees were encouraged to speak about their experiences. President of the UGA SSDP, Janis Yoon, highlighted the two words she believes every activist must remember – empathy and intersectionality. Beyond decriminalization, many attendees and speakers focussed on the importance of voting, taking a stance and using their rights to make a difference.